Mac/Eddy Today Journal #76 released! MGM Studios to be Auctioned – L.B. Mayer would turn over in his grave! 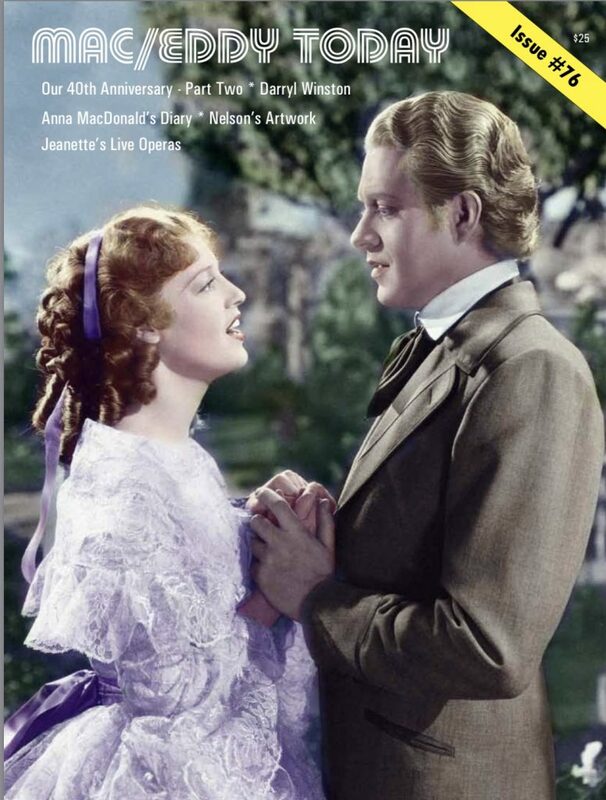 In the heyday of Jeanette MacDonald and Nelson Eddy, MGM was the most prestigious movie studio in Hollywood, boasting “more stars than there are heaven.” Studio mogul Louis B. Mayer always attributed the studio’s success to himself and sure enough, when he was finally toppled from his throne in the 1950s, MGM began a slow decline from which it never recovered. Additionally, the new moguls did away with a studio tour which was briefly available in the 1960s. Rather than turn history into a thriving tourist attraction – as Universal Studios did, MGM’s back lots were sold off for real estate value. Studio treasures such as costumes, sets, props, were sold at auction and other memorabilia such as movie stills and negatives were literally destroyed in mass burnings. I know this to be true because at the time, we had a friend who was employed at MGM and managed to salvage hundreds of Jeanette MacDonald and Nelson Eddy film stills before they were trashed. This was done at great risk to himself, because employees were fired on the spot if they were caught saving anything. Needless to say, many employees tried to protect MGM’s history as best they could, and all this memorabilia has scattered across the globe into private collections. The other memorable spot was the sound stage in which the tour guide said: “Under this current flooring is the yellow brick road from The Wizard of Oz.” Gee, don’t you think MGM could have build an entire studio tour empire just around that one sound stage? The friends I was with during the tour were familiar with the studio from the “old days” and were able to point out to me what films (that history cares about) were filmed in which sound stages. The tour guide was asking them questions! MGM’s creditors have rejected a proposal to turn their $3.7 billion in loans to the company into equity as part of a restructuring plan to keep the studio out of bankruptcy, BusinessWeek reported today (Wednesday), citing a source with knowledge of a November 4 meeting between the creditors committee and MGM CEO Stephen Cooper. Instead, two days after the meeting, they asked Cooper to seek a buyer for the company but were told that it was unlikely that the studio would fetch more than $1.5 billion, roughly what the studio’s rights to the James Bond franchise alone might be worth, the magazine said. It noted that several studios are interested in buying MGM — but not to maintain it as a viable studio. They are interested instead in its film library, the Bond franchise, and MGM’s share of the rights to the Lord of the Rings prequel, The Hobbit. Ironic that the once “lesser” studios, Paramount, Universal, 20th Century Fox, have all reinvented themselves and continue to flourish into the 21st century. Here is a great article from BroadwayWorld.com about the upcoming performance of “A Scandalous Affair” on April 19th. If you are going, or if you aren’t but just want to spread the word about the performance, be sure to add the link to this article on your Facebook or MySpace or whatever blog site you frequent. A splendid time is guaranteed for all! !